Fine Silver | Souvenirs of the Grand Tour | Skinner Auction | Skinner Inc.
BOSTON, MA – March 19, 2014 – On April 5, Skinner, Inc. will host an auction of European Furniture & Decorative Arts, featuring nearly 600 lots of objects from a variety of countries and periods, including fine silver and souvenirs of the Grand Tour from the Collection of Thomas S. Holman. Items range from English furniture to Russian silver and American cut glass to Austrian bronze figures. Skinner is pleased to offer approximately 100 lots of souvenirs of the Grand Tour from this private, Manhattan-based collection. In the 18th and early 19th century, wealthy young Englishmen embarked on lengthy travels to the Continent, known as the Grand Tour. The voyage could last months or even years, and was intended to round out one’s education, which still emphasized a strong knowledge of Classical arts and architecture, languages, history, literature, and philosophy. Later in the 19th century, the advent of rail and steamship travel allowed more middle-class adventurers to continue the tradition of the Grand Tour. Thomas S. Holman assembled his collection of souvenirs of the Grand Tour over the course of 42 years, beginning at the age of 18. His interest developed from his exposure to the ancient world through childhood trips to London, Paris, and Greece. He studied at Oxford University and the University of Vienna and traveled as an adult to Munich, Berlin, Italy, England, and France. “It’s uncommon to see a grouping of Grand Tour items of this size, making this auction a tremendous opportunity for collectors,” said Leah Kingman, European Furniture & Decorative Arts Specialist. 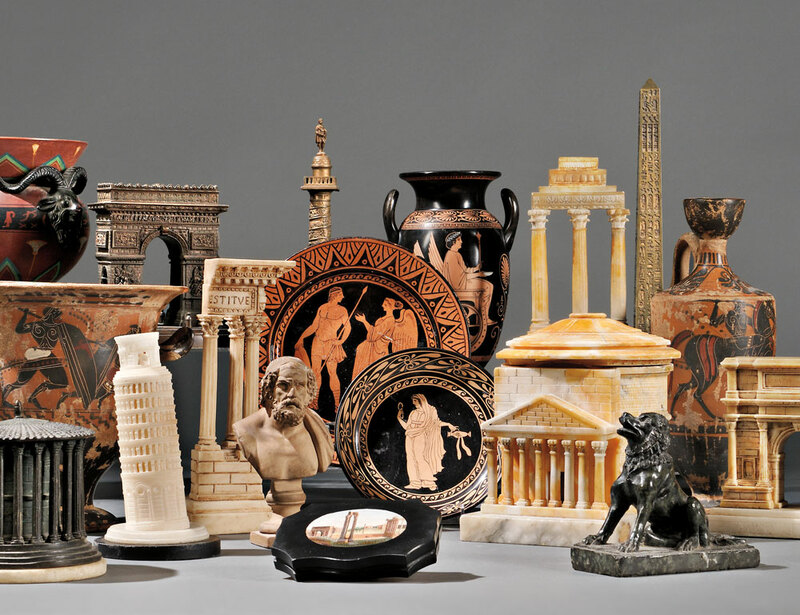 Highlights from this fascinating collection include a number of Micromosaic-inlaid Paperweights, depicting several famous Italian landmarks and other relics (Lots 251-258, estimates range from $400-$600 to $1,000-$1,500); a Group of Bronze and Marble Models of Columns and Ruins (estimates range from $400-$600 to $2,000-$3,000); and a Selection of Grand Tour Ceramic Vessels (estimates range from $400-$600 to $1,000-$1,500). Desirable furniture offerings abound in this sale, including a Spanish Baroque Gilt-metal and Bone-mounted Walnut Vargueno, (Lot 468, $4,000 to $6,000). 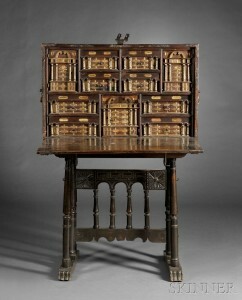 This auction includes strong examples of fine English furniture, such as the Christopher Dresser for Coalbrookdale Cast Iron Hall Stand from Shropshire, England, circa 1880 (Lot 388, $2,000 to $4,000), as well as a Pair of George III Satinwood-veneered Gate-leg Games Tables from the late 18th century (Lot 455, $2,000 to $4,000). Also available is an exceptional Extensive Meissen Blue Onion Dinner Service from Germany, circa 1900 (Lot 378, $7,000 to $9,000). A large, late 19th century Russian Iconostatis Icon Depicting the Mother of God of Galatea (Lot 321, $2,000 to $4,000) stands out, as does a beautifully-carved, white marble sculpture of a woman by Ferdinando Andreini, (Lot 481, $3,000 to $5,000). Rounding out the auction’s decorative offerings is a strong group of bronze, including Gilbert William Bayes’ Greek Dancer, circa 1905, depicting a kneeling woman holding a large hoop (Lot 451, $3,000 to $5,000), as well as an Austrian Cold Painted Bronze Figure of a Persian Warrior from early 20th century (Lot 555, $4,000 to $6,000). Skinner will offer nearly 200 lots of silver on April 5, including selections from Russia, Austria, England, and the United States. 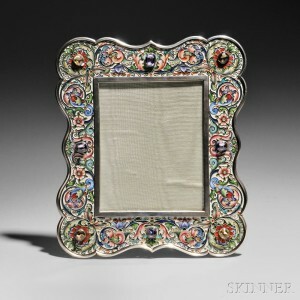 Russian highlights include a Gem-set and Cloissoné Enameled .875 Silver Frame, attributed to silversmith Orest Kurlyukov, 1899-1908 (Lot 79, $14,000 to $18,000); a late 19th/early 20th century Russian Icon with Gold-washed Silver Riza by Khlebnikov (Lot 76, $2,000 to $3,000); and a Russian Parcel-gilt .875 silver Trompe L’Oeil Sugar Box, circa 1887 (Lot 77, $3,000 to $5,000). From Austria comes a Silver Flatware Service by J.C. Klinkosch (Lot 57, $8,000 to $12,000). This extensive service, by a highly desirable maker, is in fine condition and comes with its original box. 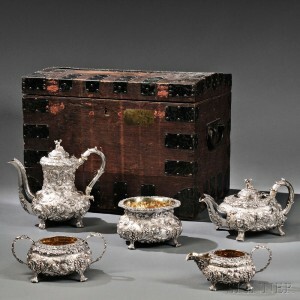 A selection of English offerings includes a Five-piece Victorian Sterling Silver Tea and Coffee Service from London c.1841-1842 (Lot 27, $8,000 to $12,000), as well as a George III Sterling Silver Two-part Centerpiece, by Joseph Preedy, also from London, c. 1801-1802 (Lot 17, $4,000 to $6,000). Examples of American silver span the continent. A Shreve & Co. 14k Golf and Golf Quartz Match Safe from San Francisco, CA, in the late 19th century be available (Lot 105, $800 to $1,200), as well as a group of ecclesiastical items from 20th century including a Gorham Gold-washed Sterling Silver Ciborium (Lot 191, $3,000 to $5,000). These pieces of ecclesiastical silver were individually commissioned by particular members of the clergy or local parishes, making each piece unique. Additional highlights include a Ball, Black & Co. Egyptian Revival Sterling Silver Covered Tureen (Lot 94, $3,000 to $5,000), and a Pair of Maison Cardeilhac Art Deco .950 Silver, Ivory and Tortoiseshell Wine Coolers from Paris, circa 1930 (Lot 70, $18,000 to $22,000). Previews for the auction will be held on Thursday, April 3, from noon to 5 P.M., and Friday, April 4, from noon to 8 P.M. Illustrated Catalog #2715B is available from the Subscription Department, at 508-970-3240, or from the Gallery. Prices realized will be available online, at www.skinnerinc.com, both during and after the sale. The Skinner website enables users to view every lot in the auctions, leave bids, order catalogs and bid live, in real-time, through SkinnerLive! This entry was posted in News and tagged 19th century, alabaster, antique furniture, antiques, British, bronze, ceramics, classical antiques, continental, decorative arts, English furniture, European, Fine Silver, Georg Jensen, gorham, grand tour, lighting, marble, religious icons, Russia, Russian antiques, russian enamel, russian silver, silver, Stuart Slavid, Thomas Holman, Tiffany by Skinner. Bookmark the permalink.